Mr lusty performs about 250 knee arthroscopies (key hole surgery) a year. Knee arthroscopy is a type of keyhole surgery, used to look inside and treat your knee joint. Small incisions are made in the skin and an arthroscope and tiny surgical instruments are inserted into the knee. An arthroscope is a small, metal tube which acts as both a light source and a camera. The operation is usually done as a day case, which means you will have the procedure and go home on the same day. It is used primarily to treat a condition that has been clearly diagnosed with an MRI scan before surgery. Multiple conditions can be treated using knee arthroscopy. The commonest is meniscal resection where a small amount of cartilage is removed from the knee. Other operations include: meniscal repair, Ligament reconstruction, removal lose bodies, chondroplasty, Microfracture, and patello-femoral alignment procedures. After surgery a tight dressing is put around the knee. It can be removed after 48 hours or before if it is uncomfortable. There are usually stitches in the portal sites which are made of dissolvable material but the best results are obtained if these are removed at 10 days. 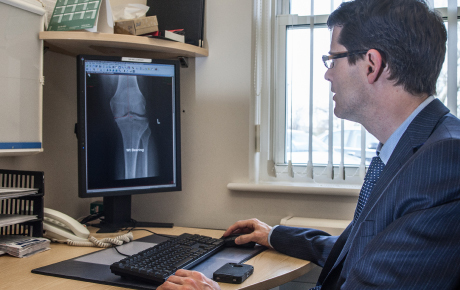 Mr Lusty is now a Consultant at Southend University Hospital specialising in lower limb elective and trauma surgery. © Copyright 2013 by Patrick Lusty. All rights reserved.